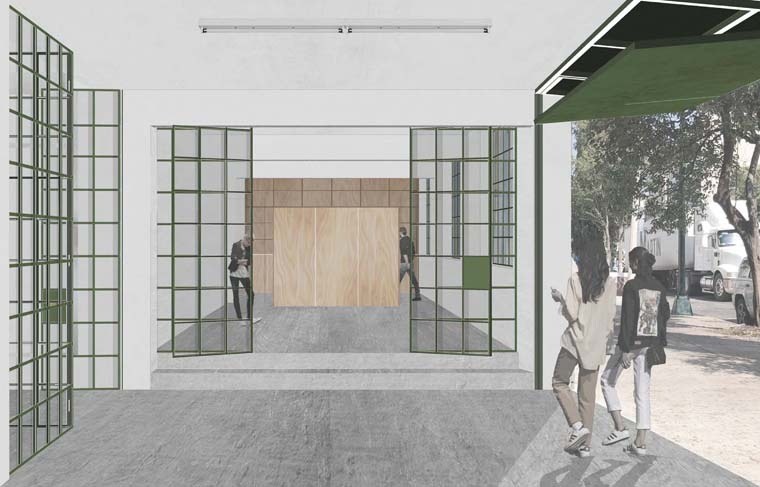 Rendering of LIGA's new gallery space, Mexico City. LIGA is an independent initiative founded in Mexico City in 2011 that promotes Latin American contemporary architecture through exhibitions, lectures and workshops. LIGA was created as a curatorial platform in order to stimulate the experimentation in relation to the architectural discipline and its possibilities as a discursive practice, expanding and establishing connections with other disciplines. The 2018–19 exhibition program continues to focus on emerging and influential architectural practices from Latin America. Due to the September 2107 earthquake in Mexico City, LIGA moved out of the space from where it had been operating since its inaugural exhibition in 2011. The 2018–19 exhibition program will be the first to take place at LIGA’s new gallery space. Pedro Ignacio Alonso holds a master’s in architecture from the Catholic University of Chile (2000) and a PhD from the Architectural Association School of Architecture (2008). His 2014 Chile Pavilion entitled Monolith Controversies, cocurated with Hugo Palmarola, was awarded a Silver Lion at the 14th Venice Architecture Biennale. Together they have curated exhibitions and presented their work at the Architectural Association in London, the Pratt Institute in New York, the Tel Aviv Museum of Art, and the Sao Paulo Cultural Centre. They are the authors of the books Panel (Architectural Association, 2014) and Monolith Controversies (Hatje Cantz, 2014), which was awarded a DAM Architectural Book Award from the Deutsches Architekturmuseum and Frankfurt Book Fair (2014). Alonso is also author of Deserta: Ecology and Industry in the Atacama Desert (ARQ, 2012), and has published articles in AA Files, San Rocco, and Manifest, and book chapters with Routledge (2013) and MIT Press (2014). He is an associate professor at the Catholic University of Chile in Santiago, a visiting tutor at the Architectural Association in London and a Princeton-Mellon Fellow 2015–16 at Princeton University. Founded by Ana Paula Galindo and Mecky Reuss, Pedro&Juana is known for generating spaces and experiences in accordance with a specific context. Their proposals include exhibitions, furniture design, public space and architectural design. They've participated in the Chicago Architecture Biennial, and won the competition organised by Domus magazine and Archivo de Diseño y Arquitectura, with Pabellón Archivo; Pedro&Juana has had a constant presence abroad with projects such as the Sobremesa space for Airbnb in Design Miami 2016, and recently with Power Ball XIX: Stereo Vision, in collaboration with the fashion house Max Mara. The project consisted in the design of a space for a famous art fair party in Toronto, where they worked with the artist Francesco Pedraglio. They recently developed a project for the Art Institute of Chicago. PRODUCTORA is a Mexico City based architectural studio founded by Abel Perles, Carlos Bedoya, Victor Jaime, and Wonne Ickx. PRODUCTORA's work is distinguished by an interest in precise geometries, the production of clearly legible projects with limited gestures and the search for timeless buildings in their material and spatial resolutions. The office is working on projects in Mexico and abroad, ranging from residential projects to public buildings. Its work has been presented in architectural biennials in Beijing (2006) and Venice (2008), in the National Art Museum of Beijing, and in the Victoria & Albert Museum in London. In 2011 PRODUCTORA founded, alongside curator and art critic Ruth Estevez, LIGA. Ruth Estévez was the director and curator of the Gallery at REDCAT in Los Angeles until early 2018. Between 2007–11, Estévez served as the chief curator at the Museo de Arte Carrillo Gil, Mexico City, where she curated various exhibitions and projects with artists such as Mark Manders, Guy Ben-Ner, and Fernando Ortega, amongst others. In 2011, Estévez cofounded LIGA and has written extensively for various exhibition catalogues and art publications and has independently organized exhibitions in Spain, Belgium, the US, as well as in Mexico. She holds a master's degree in art history from Mexico's Universidad Nacional Autónoma de México where she is a PhD candidate. Founded in 2011, LIGA-Space for Architecture is a not-for-profit organization that promotes emergent Latin American architecture and fosters debates about the built environment in Latin America. One of its main ambitions is the production of knowledge from within the region, establishing bridges between the different institutions within the area. Since 2011, LIGA has organized 26 exhibitions by emerging architectural talent from over ten countries (Argentina, Peru, Chile, Brazil, Uruguay, Paraguay, Venezuela, Mexico, Colombia, Guatemala, Spain and Portugal). In parallel to the exhibitions, there is a regular program called Interludes, which present conferences, workshops, debates and performances, proposing tangential relationships with architecture. All of our events are free and accessible to everyone.